2205001 1340XL Daewoo 1340XL Skid Steer Loader Operation manual. Service manual. Spare parts catalog. Schematics. 2205002 1550XL Daewoo 1550XL Skid Steer Loader Operation manual. Service manual. Spare parts catalog. Schematics. 2205003 1760XL Daewoo 1760XL Skid Steer Loader Operation manual. Service manual. Spare parts catalog. Schematics. 2205004 2060XL Daewoo 2060XL Skid Steer Loader Operation manual. Service manual. Spare parts catalog. Schematics. 2205005 430 Daewoo 430 Skid Steer Loader Operation manual. Service manual. Spare parts catalog. Schematics. 2205006 430 Plus Daewoo 430 Plus Skid Steer Loader Operation manual. Service manual. Spare parts catalog. Schematics. 2205007 440 Plus Daewoo 440 Plus Skid Steer Loader Operation manual. Service manual. Spare parts catalog. Schematics. 2205008 450 Daewoo 450 Skid Steer Loader Operation manual. Service manual. Spare parts catalog. Schematics. 2205009 450 Plus Daewoo 450 Plus Skid Steer Loader Operation manual. Service manual. Spare parts catalog. Schematics. 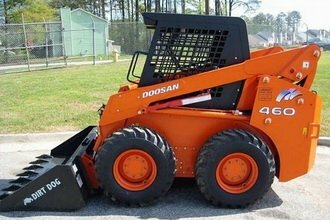 2205010 450 Plus Tier-3 Daewoo 450 Plus Tier-3 Skid Steer Loader Operation manual. Service manual. Spare parts catalog. Schematics. 2205011 460 Daewoo 460 Skid Steer Loader Operation manual. Service manual. Spare parts catalog. Schematics. 2205012 460 Plus Daewoo 460 Plus Skid Steer Loader Operation manual. Service manual. Spare parts catalog. Schematics. 2205013 460 Plus Tier-3 Daewoo 460 Plus Tier-3 Skid Steer Loader Operation manual. Service manual. Spare parts catalog. Schematics. 2205014 460 Plus Daewoo 460 Plus Skid Steer Loader Operation manual. Service manual. Spare parts catalog. Schematics. 2205015 470 Plus Daewoo 470 Plus Skid Steer Loader Operation manual. Service manual. Spare parts catalog. Schematics. 2205016 DSL601 Daewoo DSL601 Skid Steer Loader Operation manual. Service manual. Spare parts catalog. Schematics. 2205017 DSL602 Daewoo DSL602 Skid Steer Loader Operation manual. Service manual. Spare parts catalog. Schematics. 2205018 DSL702 Daewoo DSL702 Skid Steer Loader Operation manual. Service manual. Spare parts catalog. Schematics. 2205019 DSL802 Daewoo DSL802 Skid Steer Loader Operation manual. Service manual. Spare parts catalog. Schematics. 2205020 DSL902 Daewoo DSL902 Skid Steer Loader Operation manual. Service manual. Spare parts catalog. Schematics.